Window fashion for bar and restaurants has changed dramatically compared to the last few recent decades. Old restaurants preferred curtains and draperies over other types of window covers while others preferred roman shade which is some sort of a hybrid between draperies and blinds. However, for this present decade, we see lots of bar and restaurants transitioned from this hard-to-maintain curtains and draperies to more practical and functional roller blinds. 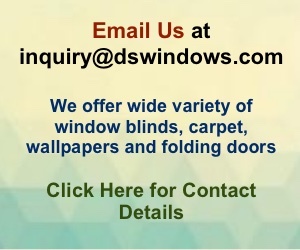 It’s one of the most in-demand window shades not only here in the Philippines but also around the world. This window fashion trend is still going strong as more elegant and robust fabrics are made available to the market. 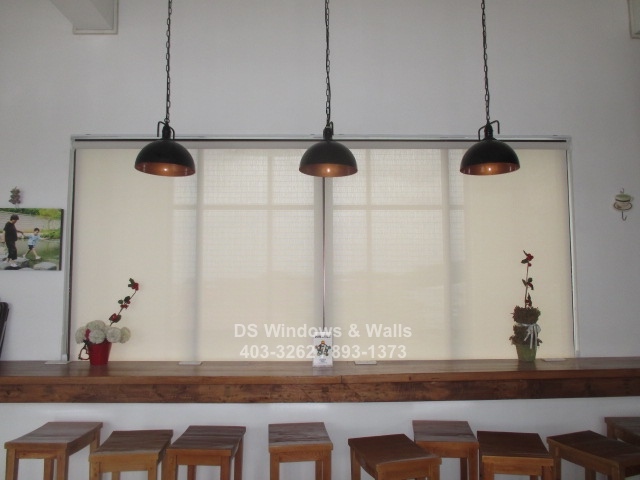 Sunshadow roller shades are ideal window treatment for restaurants because of its multiple advantages in functionality and it contributes in making a pleasant atmosphere for diners. For this type of industry it’s customary to be surrounded by glass windows so the diners can enjoy the outside view while eating and drinking, but it also has its disadvantages because it also welcomes the heat and glare from the sun which is very unpleasant to anyone. By installing functional yet fashionable window covers you can reduce the sun’s heat and glare while preserving a translucent view to the outside while also providing a dim light which makes the room more cozy and welcoming. 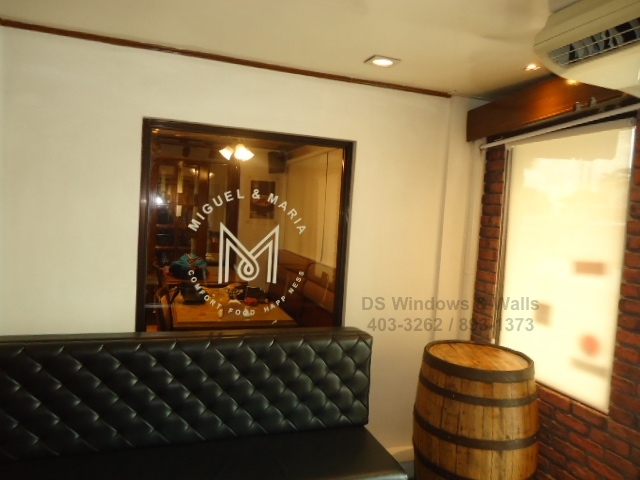 Roller shade can also make a huge impact on the whole interior design of a bar or a restaurant like our featured client in Marikina. 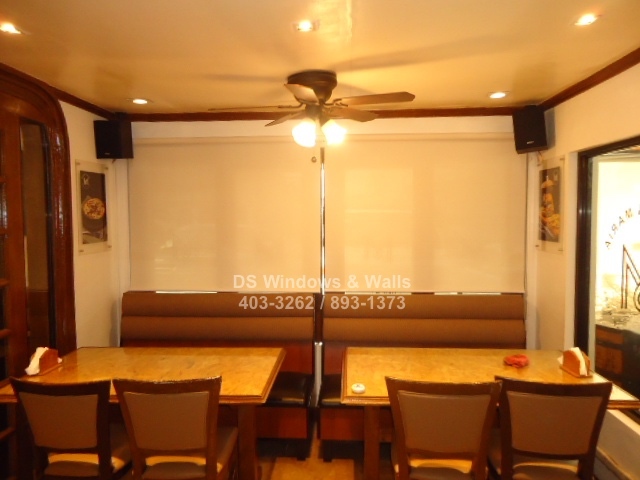 As you can see, the first two photos are samples of a bar that chose to install sunshadow roller shade as their window treatment. 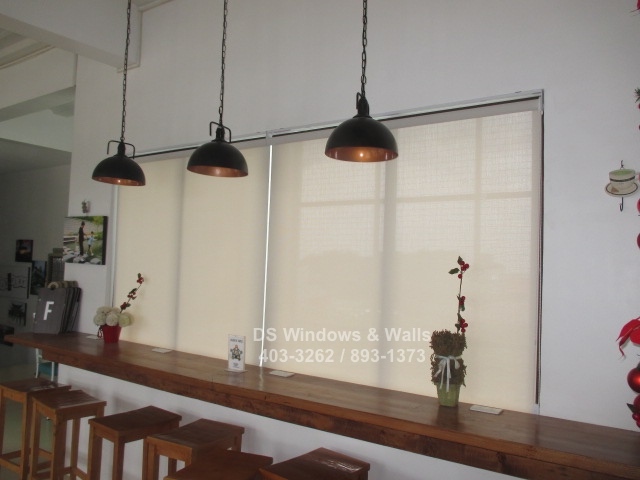 Looking at the picture our client only chose plain white fabric for the blinds that doesn’t look too extravagant or anything special, yet has the air of sophistication and modernity that synchronize with the surroundings and matches well with the wood counter bar. Diners love to eat near the windows to have a great view of the outside and the dim light bring a comfortable feel in the room which is both possible with roller shades. Our featured restaurant also has different design in different rooms like the third room is more of a classic-modern design while the fourth picture is more stylish and classy. Roller shades easily match any type of room design like this featured client with vintage brick wall and black leather couch, which is a very conflicting combination yet it somehow feels united with roller shades. Other than reducing sun’s glare and heat, preserving your restaurant view and boosting your interior roller shades has more advantages that makes it the number one choice for commercial blinds. The maintenance is pretty easy with just the use of a vacuum cleaner or wet cloth, great functionality, affordability and it’s also approved under safety fire codes which is very appropriate for all types of restaurant. How Do Combi Blinds Work?